Industrial Basket Strainer - B.K. EQUIPMENTS PVT. 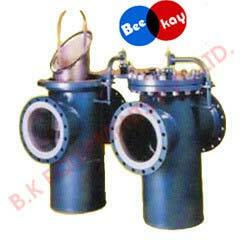 LTD.
We are well reckoned as one of the supreme Basket Strainer Manufacturers and Suppliers, based in India. Our Industrial Basket Strainer is designed to efficiently remove various foreign particles from flowing pipes. Moreover, our Flanged Basket Strainer is also ideal for enhancing the life of valves, pumps and various other flow control equipment.